For other people named Bobby Brown, see Bobby Brown (disambiguation). He also starred in films such as A Thin Line Between Love and Hate and Two Can Play That Game. He returned to New Edition for a reunion album and tour from 1996 to 1997, and returned with all six members for another stint in 2005. In 1992, Brown married singer Whitney Houston, with whom he had daughter Bobbi Kristina Brown. The couple starred in the 2005 reality show Being Bobby Brown. In 2007 their marriage ended in divorce. Brown was born in Boston, Massachusetts, as one of eight children of Carole Elizabeth (born Williams), a substitute teacher, and Herbert James Brown, a construction worker. Brown grew up in Roxbury's Orchard Park Projects. Brown's first taste of being onstage occurred when he was three and one of his childhood idols, James Brown, performed in Boston. This performance sparked a dream of becoming a singer. Brown joined the church choir, where he recognized and developed his singing abilities. New Edition was founded by 9-year-old Brown and childhood friends Michael Bivins, Ricky Bell, Travis Pettus and Corey Rackley who all knew each other growing up in the Orchard Park Projects in Boston. However, Rackley left the group early and good friend Ralph Tresvant joined the group at the suggestion of Bell who sang with Tresvant as a duo. Brown was also familiar with Tresvant since they were children. Travis Pettus would also leave the group and they became a quartet of Bell, Tresvant, Bivins, and Brown. In 1982, they became a quintet when their manager Brooke Payne insisted on bringing in his nephew Ronnie DeVoe, to complete the group. After performing in several talent shows in the Boston area in 1982, they signed a deal with fellow Bostonian Arthur Baker's Streetwise Records, who released their debut album Candy Girl. The title track, on which Brown sang co-lead alongside Bell and Tresvant, was a top-20 hit on Billboard's R&B Singles Chart in 1983. Brown's first full lead vocal performance was on the New Edition ballad "Jealous Girl," which was a minor hit when it also charted in 1983. The group became pop sensations with their self-titled second release. The album included the crossover hits "Cool It Now" and "Mr. Telephone Man," which Brown also co-led. Despite the group's success, however, Brown felt the group was never rightfully paid the money they felt they had earned from their success, later saying, "The most I saw from all the tours and all of the records we sold was $500 and a VCR." Brown also allegedly grew jealous of the attention given to fellow New Edition member Ralph Tresvant, and during some of their tour performances would often step out of his position and perform out of turn, singing and performing seductively, which caused concern within the group's management team. Brown was featured on two more New Edition albums before leaving the group in early 1986. Brown later said he felt that the group's management treated them "like little slaves by people who were only interested in money and power, and not in the welfare of New Edition." Some controversy arose over the way Brown was removed from the group. Some say Brown asked to be let out of New Edition, but a VH-1 Behind the Music documentary on the group claimed Brown was voted out by the group via their management team, with the members—most prominently Tresvant—against the decision. Following his exit from New Edition, Brown signed a contract with his former group's label, MCA (which had earlier promised Brown a solo deal if he had decided to leave New Edition), and also signed with manager Steven Machat, who had also worked with New Edition. The label released his debut album King of Stage in 1986. Brown had a number-one R&B hit with the ballad "Girlfriend," but the album otherwise failed to perform well. Brown laid low for more than a year while working on his follow-up album. With the help of Machat and MCA representative Louil Silas, Brown began working with some of the top R&B producers and songwriters of the time, including Babyface, Antonio "L.A." Reid and Teddy Riley. The producers helped to compose what became Brown's most successful solo album of his career, Don't Be Cruel. Released in 1988, the album launched five top-ten hits on the Billboard Hot 100, including the number-one single, the self-penned "My Prerogative", which became, along with "Every Little Step" and the title track, signature hits for the performer. After topping both the pop and R&B charts, album sales would eventually reach twelve million copies worldwide, making it the best-selling album of 1989. In February 1990 he won the Grammy Award for Best Male R&B Vocal Performance for the album's fourth single "Every Little Step." Don't Be Cruel also garnered Brown two American Music Awards, a Soul Train Music Award and a People's Choice Award. In 1989, Brown contributed two songs to the soundtrack of Ghostbusters II, and he also had a cameo role in the film. Leading off the soundtrack album, "On Our Own" became another top-ten single for the singer, peaking at number two. The same year, a remix compilation, Dance!...Ya Know It!, was released, and found fans in the United Kingdom, where Brown had a fan base and had major success. Brown embarked on a 120-day world tour to promote the Don't Be Cruel project in 1988. The tour was a success, with Al B. Sure! opening for him, and New Edition also opening for him on some dates. The tour lasted into the spring of 1991, but not without Brown gaining notoriety for simulating sexual acts onstage, which got him into trouble with local law enforcement. In 1990, Bobby performed "Tap into My Heart" at the 1990 MTV Awards, and Brown was set to release the album Mystical Magic, but it was shelved for reasons unknown, and never saw the light of day. In 1990, Brown was featured on the number-one hit "She Ain't Worth It" by Glenn Medeiros, making it his second number 1 hit on the pop chart, and also collaborated with Babyface for the remix of the latter's single "Tender Lover" that same year. Brown stayed busy and, in 1991, he collaborated with New Edition member and friend Ralph Tresvant on the latter's single "Stone Cold Gentleman", which was a top-five R&B hit. Brown's next album Bobby wouldn't arrive until 1992. Despite its release during the final days of the New Jack Swing era—one that Brown had dominated—the album did become a success, selling more than 3 million copies, and spawning several hit singles including "Humpin' Around", "Get Away," and "Good Enough". He received his second Grammy Award for Best Male R&B Vocal Performance nomination for "Humpin' Around." He received his third American Music Award in January 1993. However, sales of Bobby did not match its predecessor. Some surmise that this may have been due to Brown's recent marriage to Whitney Houston, and his decision to take a break from the business for reasons involving his marriage and impending new-fatherhood. In any case, he and Houston had recorded a song together, "Something in Common," which was released as a single from the Bobby album. Four years later he would release his fourth solo album Forever, in 1997. Due to lack of promotion and Brown's desire to break from previous success patterns and write and produce most of the tracks, the album tanked, and the album's only single, "Feeling Inside", was not successful. Prior to the release of Forever, Brown had been in negotiations with rapper Tupac Shakur to sign with Shakur's new label Makaveli Records, or with the proposed label Death Row East. However, Shakur died before that could take place. Leaving MCA following Forever, Brown laid low for several years, appearing as a featured artist in 2001 on two tracks from The Benzino Project, and in 2002 he was featured in a duet with rapper Ja Rule on the song "Thug Lovin'." Brown was signed to Murder Inc. Records, but that label had already begun to dissolve, so Brown's tenure with them was brief. In 2006 Brown appeared adding vocals to Damian Marley's song "Beautiful" on Marley's album, Welcome to Jamrock. In 2010 Brown was featured in a duet with singer Macy Gray on the song "Real Love" on Gray's album The Sellout. About this project, Gray explained to Essence, "Actually, he came to the studio, since he doesn't live far, and knocked out his recording in two hours. We're friends, and his one-year-old son is my godson. His fiancée is one of my best friends in the whole world. I met Bobby a long time ago, but we really got to know each other through her." On June 5, 2012, Brown released his fifth album, The Masterpiece, which debuted at number 41 on the R&B album chart. On February 14, 2017, Brown performed at the Valentine's Day Music Festival with Keith Sweat, Avant and El DeBarge. Brown made his first reunited appearance with New Edition at the 1990 MTV Video Music Awards. Their performance later sparked the recording of Bell Biv DeVoe's "Word to the Mutha!" in 1991; on which Brown, Ralph Tresvant and later NE member Johnny Gill were included. A full-fledged reunion occurred with the 1996 release of the album, Home Again. Brown contributed lead vocals on two hit singles, "Hit Me Off" and "You Don't Have to Worry". However, a subsequent 1997 tour to support the album led to problems between Brown and the other New Edition members. Brown later admitted that he was struggling with drug addiction and alcoholism during the tour. In 2005, at the BET 25th anniversary special, Brown again reunited with New Edition to a receptive audience. In 2008, Brown, Ralph Tresvant, and Johnny Gill then formed a splinter group, Heads of State, to compete with Bell Biv DeVoe. At the 2009 BET Awards, following the death of the group's idol Michael Jackson, all six of the New Edition members again reunited to perform a medley of Jackson 5 hits in honor of Jackson. This sparked rumors of another full-fledged New Edition reunion, which was confirmed the following year. As of 2016, Brown and New Edition continue to perform together. Bobby Brown's musical influences spark from artists such as Rick James, Michael Jackson, Marvin Gaye, and Prince. Brown can be heard emulating grunts and "Ow's" made popular by James Brown as well as Prince. Brown made his acting debut with a cameo appearance in the 1989 film, Ghostbusters II, playing the Mayor's doorman. The following year, he appeared in the HBO kids show, Mother Goose Rock 'n' Rhyme playing all three characters of Three Blind Mice. In 1995, he made another guest appearance in the film, Panther, and had a major role in the Martin Lawrence film, A Thin Line Between Love and Hate. Brown made other guest appearances in the films, Two Can Play That Game, Gang of Roses, Nora's Hair Salon and Go for Broke. In 2005, Brown signed a deal with Bravo to overlook the direction of the reality series, Being Bobby Brown, but it was said[by whom?] that he had to convince producers that his then-wife Whitney Houston would appear on the show. Houston later told Oprah Winfrey that she agreed to do it because she "loved him" and "did whatever he asked because I was his wife." The Hollywood Reporter said that the show was "undoubtedly the most disgusting and execrable series ever to ooze its way onto television". Despite the perceived train-wreck nature of the show, the series gave Bravo its highest ratings in its time slot. The show lasted one season but received bad reviews in the duration of its run, leading to a fallout in both singers' careers; it ended in 2006 after Houston refused to appear in a second season. The couple divorced soon after. In June 2007, Brown took part in the ITV television series "24 hours with...", a chat show format as celebrity and interviewer spend an intense 24 hours locked in a room together. The show's host, Jamie Campbell, asked Brown questions about his career and private life, and infamously joked about making "sexual moves" towards the singer. Brown was furious and threatened to beat Campbell up live on air. Brown's later tenures in reality shows included appearances on Real Husbands of Hollywood, Celebrity Fit Club and Gone Country. Brown has fathered seven children. His eldest, Landon, was born circa 1986 to Melika Williams. With girlfriend Kim Ward, whom he met circa 1980, he had daughter La'Princia (born 1989) and son Bobby Jr. (born c. 1992). Brown and Ward's on-and-off 11-year relationship ended in 1991, after two-months-pregnant Ward found out Brown was engaged. Brown first met Whitney Houston at the Soul Train Music Awards in 1989. They began a close friendship after Houston invited 20-year-old Brown to her 26th birthday party in August 1989. Their friendship developed into a romance in 1991. In April 1992, Brown proposed marriage to Houston and the couple married at Houston's estate on July 18, 1992. On March 4, 1993 their daughter Bobbi Kristina Brown was born. Houston and Brown later collaborated on the hit single "Something in Common", which included their daughter at the end of the video. Throughout their 14-year marriage, Houston and Brown went through periods of infidelity and drug use. Their personal issues became comedy fodder for talk shows and sketch comedy shows, most notably MadTV, where they were satirized as abusive drug addicts. Aries Spears portrayed Brown as a jealous, verbally abusive has-been who openly bristles at his wife's (Debra Wilson) iconic reputation and popularity. On January 11, 2000, airport security guards discovered marijuana in both Brown's and Houston's luggage at a Hawaii airport, but the two boarded the plane and departed before authorities could arrive. Charges were later dropped. In 2005, the couple participated in the reality show Being Bobby Brown, which scrutinized their personal life even more thoroughly. In September 2006, Houston filed for legal separation; the divorce was finalized on April 24, 2007, with Houston receiving custody of their then-14-year-old daughter. In a September 2009 interview with Oprah Winfrey, Houston admitted to using drugs with Brown, stating that Brown had "laced marijuana with rock cocaine". Houston also told Winfrey that Brown had been emotionally abusive during their marriage, and had even spat on her on one occasion. In 1995, Brown was with Steven Sealy when Sealy was targeted in a drive-by shooting. Sealy, Brown's sister's boyfriend, was killed and Brown was unharmed. The shooter, John Tibbs, took a plea agreement in 2001. On May 31, 2009, Brown had a son Cassius with his partner of two years, manager Alicia Etheredge. Brown and Etheredge became engaged in May 2010, when Brown proposed during a performance at the Funk Fest in Jacksonville, Florida. The couple married in June 2012 in Hawaii and have since added two daughters to their family: Bodhi Jameson Rein Brown on July 9, 2015; and Hendrix Estelle Sheba Brown on July 21, 2016. Brown's parents, Carole and Herbert Brown, died within a year of each other, Carole in 2011 and Herbert "Pops" in January 2012, a month before his ex-wife Whitney Houston's death. Following the death of his ex-wife Houston on February 11, 2012, six days after his 43rd birthday, he struggled to perform at a New Edition show, shouting "I love you, Whitney" in tears. Brown then excused himself from the stage and New Edition finished the remainder of the show. Brown was invited to appear at Houston's memorial service in New Jersey but was asked to leave by Houston's family security. In an interview given to The Today Show in May 2012, Brown said security was the reason he and his family left Houston's service; Brown stated that he loved Houston's family and told Matt Lauer that he had spent "14 beautiful years" with Houston as his wife. He also denied rumors that he introduced Houston to narcotics. Along with Clive Davis, Ray J, and others, Brown has been accused of contributing to the singer's death. In January 2015, Bobbi Kristina Brown, Brown's daughter with Houston, was found unconscious in her bathtub at her residence in Roswell, Georgia. The 21-year-old was rushed into North Fulton Hospital where she was placed on a ventilator in a medically-induced coma to stop the swelling of her brain. It was later reported her brain activity was "low". Brown rushed to his daughter's side and released a statement to the press requesting them to respect the family's privacy. She was later transferred to Emory University Hospital. After doctors concluded that significant brain function was unlikely to occur, Bobbi Kristina was removed from the ventilator and put in the care of Hospice in Duluth, Georgia. She died there on July 26, 2015 at age 22. As a child, Brown was diagnosed with ADD and was later diagnosed with bipolar disorder in his early thirties. Brown said that his drug of choice was marijuana and that he had developed alcoholism at an early age. Prior to his marriage to Houston, Brown began using cocaine. Between 2012 and 2013, Brown was arrested for DUIs and underwent treatment in rehab for alcohol abuse. He was portrayed by Aries Spears on MADtv with his former wife portrayed by Debra Wilson. He was portrayed by Tracy Morgan and Finesse Mitchell on Saturday Night Live. He was portrayed by Arlen Escarpeta in the television film Whitney. He was portrayed by Woody McClain in the 2017 miniseries The New Edition Story. His marriage to Whitney Houston was a topic in the film Whitney. He was portrayed again by Woody McClain in the 2018 miniseries about his life, The Bobby Brown Story. ^ a b Huey, Steve. "[Bobby Brown] Artist Biography". AllMusic.com. Retrieved March 22, 2015. ^ "Whitney Houston shows for funeral in Roxbury". Boston.com. Retrieved 25 June 2015. ^ "Bobby Brown's Uneasy Passage". Rolling Stone. Retrieved 25 June 2015. ^ "From boy band to bloated: Bobby Brown". Boston.com. Retrieved 25 June 2015. ^ "BOBBY BROWN UNHURT AS GUNMAN SLAYS PAL". The Daily News. Retrieved 25 June 2015. ^ "Singer Bobby Brown Uninjured After Shootout Which Killed Friend Brown Was Leaving Seedy Bar Near His Boyhood Neighborhood - Spokesman.com - Sept. 29, 1995". The Spokesman-Review. Retrieved 25 June 2015. ^ Hilburn, Robert (September 27, 1992). "How Cruel Can Fame Be, Bobby Brown?". The Los Angeles Times. Retrieved 2010-11-25. ^ Hillary Crosley. "Macy Gray on 'The Sellout' and Finding Bobby Brown". ^ Penrose, Nerisha. "Where are the Six Members of New Edition Now?". Billboard.com. Retrieved 6 February 2017. ^ "Artist Influences for Bobby Brown". MTV.com. Retrieved 2013-02-22. ^ "BROWN'S 24 HOURS OF ANGER – 3am & Mirror Online". Mirror.co.uk. 2007-05-12. Retrieved 2012-02-12. ^ "Bobby Brown's Son Admits The One Thing He Deeply Regrets Doing To Whitney". 2 April 2016. ^ Spelling per her Twitter account: La'Princia Q. Brown. Retrieved on February 24, 2016. ^ Wolfson, John (July 2004). "Bobby Brown's Bum Rap". Boston Magazine. Retrieved February 24, 2016. ^ Silverman, Stephen M. (2006-11-18). "Whitney Houston Files for Divorce". People. Time, Inc. Retrieved 2009-02-08. ^ "Houston wins custody of daughter". BBC News. April 5, 2007. Retrieved April 26, 2010. ^ "Spotlight On: Bobby Brown R&b Bad Boy Trying To Walk `A Thin Line'". tribunedigital-mcall. Retrieved 25 June 2015. ^ "Not Who You Think She Is". people.com. Retrieved 25 June 2015. ^ "Admits to '95 slaying in plea agreement. (News) - HighBeam Business: Arrive Prepared". Archived from the original on 2015-06-26. ^ Brown in "Bobby Brown Welcomes Son Cassius". People. June 4, 2009. I just had a baby. Four days ago — my son Cassius. ^ "Bobby Brown Gets Engaged – On Stage!". People. May 9, 2010. ^ Vokes-Dudgeon, Sophie (July 16, 2015). "Bobby Brown Names His Newborn Daughter Amid Bobbi Kristina Tragedy". Us Weekly. Retrieved February 24, 2016. ^ Webber, Stephanie (July 30, 2016). "Bobby Brown's Newborn Daughter's Name Is Revealed: 'I'm Grateful'". Us Weekly. Retrieved December 22, 2016. ^ "Whitney Houston Performs at Mama Brown's Family Funeral". tmz.com. Retrieved 25 June 2015. ^ "Bobby Brown's Dad Herbert -- Dead at 82". tmz.com. Retrieved 25 June 2015. ^ "Bobby Brown Says 'I Love You, Whitney' During Emotional Concert". Billboard. February 12, 2012. Retrieved February 12, 2012. 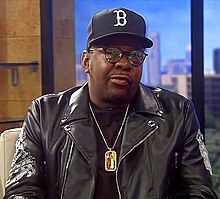 ^ "Bobby Brown Speaks Out on Whitney Houston's Funeral in 'Today' Interview". The Hollywood Reporter. May 1, 2012. Retrieved 2 May 2012. ^ Furek, M.W. (2015). "Gotcha…Playing the Whitney Houston Blame Game". Counselor, the Magazine for Addiction and Behavioral Health Professionals. Vol. 16 no. 4. Deerfield Beach, Florida: Health Communications, Inc. pp. 14–17. ^ "Bobbi Kristina Brown moved to new hospital amid fight for life". ^ Respers France, Lisa (July 26, 2015). "Bobbi Kristina Brown dies at 22". CNN. Retrieved July 26, 2015. ^ Marcia Purse. "Bobby Brown". About.com Health. Retrieved 25 June 2015. ^ Seemayer, Zach (June 7, 2016). "Bobby Brown Opens Up About Doing Drugs With Whitney Houston, Denies Abuse Allegations: 'I've Never Been a Violent Person'". Entertainment Tonight. Retrieved September 7, 2018. ^ Kaufman, Gil (December 3, 2003). "Bobby Brown Turns Himself In, Appears In Court With Whitney At His Side". MTV News. New York City: Viacom. Retrieved June 25, 2015. ^ "Judge orders Bobby Brown arrested". USA Today. Mclean, Virginia: Gannett Company. October 2, 2006. Retrieved October 2, 2006. ^ "Bobby Brown Is Back in Rehab, Wife Alicia Etheredge Says". US Weekly. Retrieved 14 August 2012. ^ "Bobby Brown Arrested in Los Angeles; DUI Suspicion". The New York Times. October 24, 2012. ^ "Bobby Brown slapped with 55-day jail sentence on drunk-driving rap". New York Daily News. February 26, 2013. ^ ABC News. "Bobby Brown Serves 9 Hours of 55 Day Sentence". Good Morning America. Retrieved 25 June 2015. ^ Alan Duke, CNN (21 March 2013). "Bobby Brown out of jail in hours". CNN. Retrieved 25 June 2015.